So, Michael and his painting and all has got me all inspired and motivated, and I needed a gift for my cousin's little girl Addisyn's 1st Birthday. So, perfect timing, right? Apparently, it's even better for me than I thought to spend time with fellow artists! A good start on the first wing. Realized the original wing layout was not going to work and frogged quite a bit of work and redid it for a much better result. Feet and legs are done, including cuffs on pants which will match shirt! Body is finished, including sleeve and hem ruffles on shirt. Heart design on shirt is simple colorwork rather than embroidery. 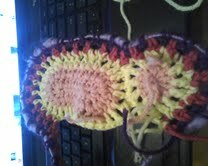 All crochet work is done, most ends are finished, wings attached. Note shoulder straps. She is not a pixie or a fairy, but a little girl wearing butterfly wings. Finished doll. Light hair and blue eyes like the recipient! All in all, it was great to be making a doll again, so thank you to Michael for the motivation and Jeremy and Sue for the occasion! And, BONUS! She was a huge hit!